I entered Wharton as an undergraduate in September 1976 and gradudated in May 1980. 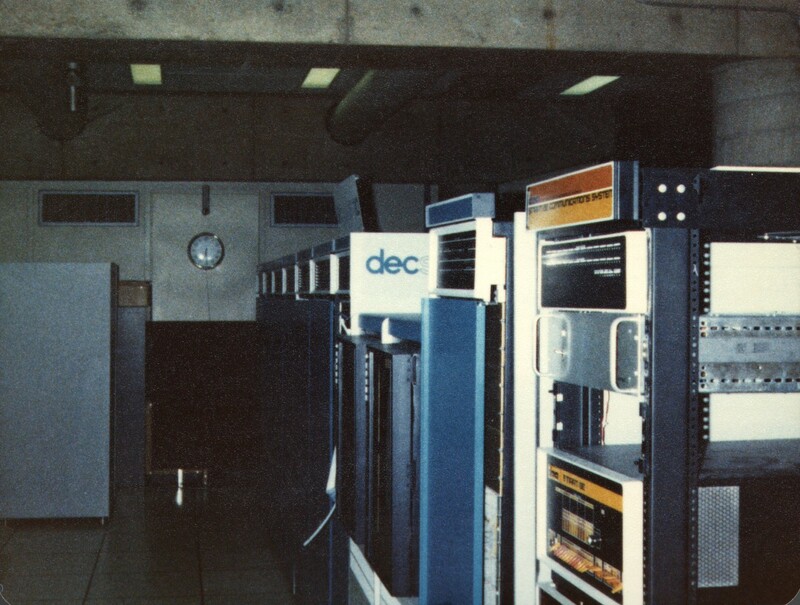 I was employed as a part-time student Computer Operator of Wharton's DECsystem-10 from December 1976 until May 1980, at which time I became a full-time employee of Wharton, as Manager of Computer Operations. I held that position until May 1981 when I received my M.S. Engineering (Computer Science), which under tax law at that time, was 100% paid for as an employee benefit of the University of Pennsylvania. These photographs were taken in April 1979, and the original photographs (with some surface texture as you will see) were scanned in 18 years later -- February 1997, and were uploaded to the web in April 2007, 28 years after they were taken! Wharton was the first entity in the greater Philadelphia metropolitan area to have a connection to what would later be known as the Internet. Specifically, this was a connection to the ARPAnet, which was possible because of federally funded research being conducted by Prof. Howard L. Morgan, who was also my thesis advisor. 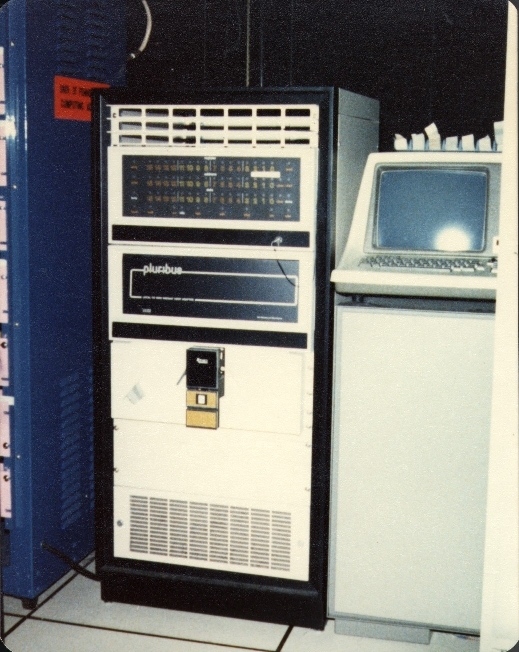 The last photo on this page shows the BBN IMP Pluribus VDHA which provided ARPAnet connectivity between Wharton's DECsystem-10 and the rest of the ARPAnet. 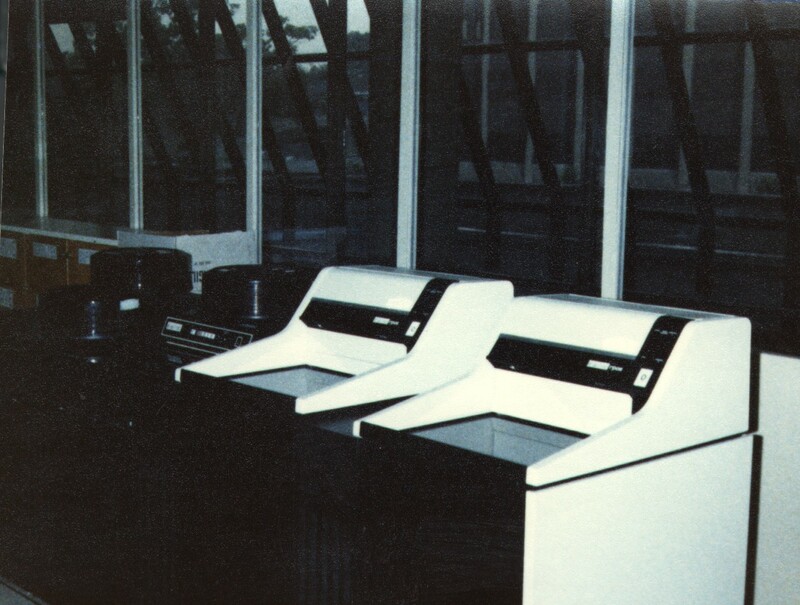 In the photo below, the keyboard (lower left) is the computer console, specifically a printing terminal named a DECwriter.Commands were typed in, and output was read on the paper, which would stack behind on a catch-tray. The 19" rack with orange faceplate was a PDP-8 which served as a communications front-end. Below is a view of the long front-row of the system, more than 20 feet long! Below is the front panel of the KL10 processor. The round discs are small reels of magenetic tape, named DECtape. The toggle switches allowed inspection etc of memory locations. Once when the system was down because of a disc controller problem, I toggled in a small program in binary (from an Assembler listing), quite tedious! 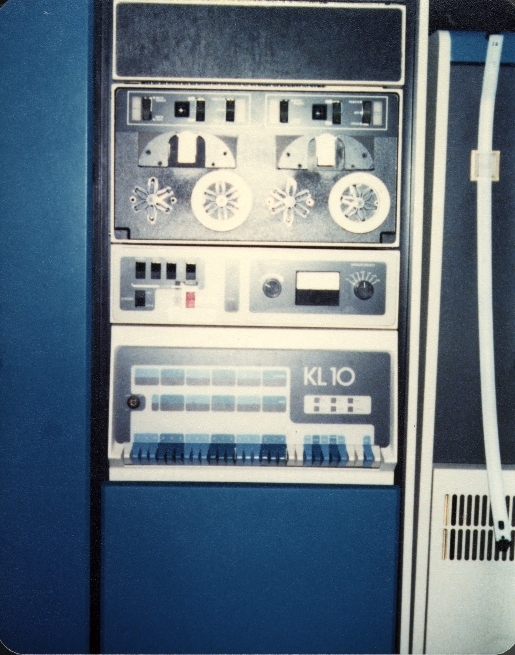 The vertical white piece of plastic hanging in the right of the photo is the outside of a 9-track tape reel. You don't seem those anymore! Below the CPU cabinet has been opened and you can see the wire-wrapped backplane. 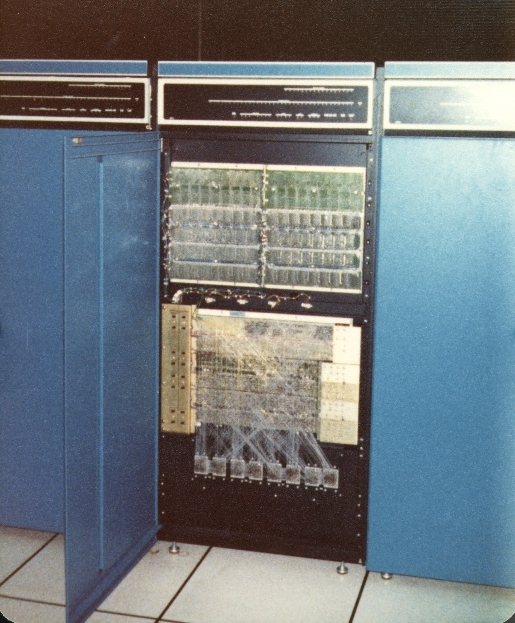 Here another cabinet has been opened and you can see an even larger wire-wrapped backplane. 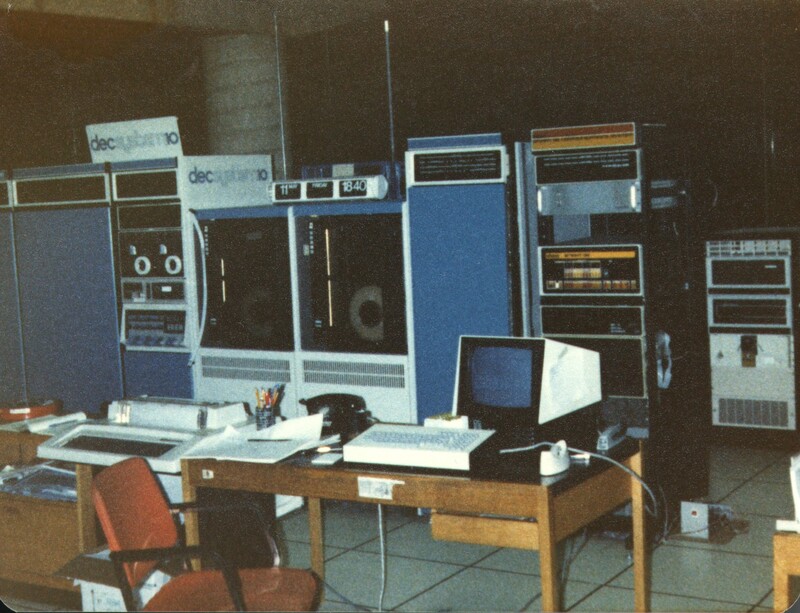 The photo below shows four disk drives. 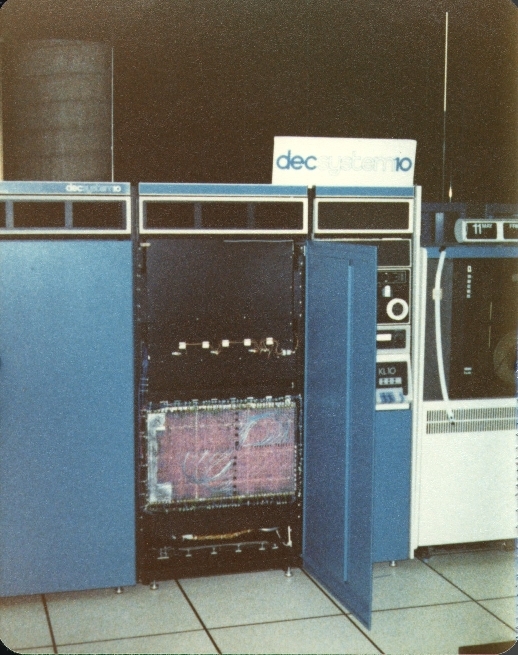 The two on the left are RP04 disk drives and the two on the right are RP06. Keep in mind that the capacities shown supported ALL ACADEMIC COMPUTING (student and faculty) through at least 1981! (for my digital camera) at the office-supply store Staples for only US$25! 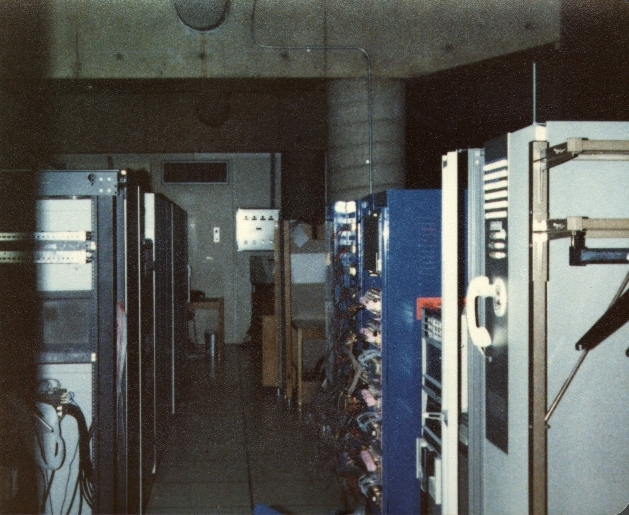 The large box in the left of the photo below is a memory cabinet, which was added on, the doubling of the system's memory dramatically improved system performance. That is still true today -- adding memory is often the least expensive way to improve a computer's performance. The system ended up with just over 1 MegaByte of main memory! The original memory of the DECsystem-10 was "core memory" (tiny little magnetic donuts, each of which stored one bit). Last weekend I was reading C. Gordon Bell's book "Computer Engineering: A DEC View of Hardware Systems Design"". Although the book was published in 1978 (by Digital Press), it has a LOT of timeless information about computer architecture and design. 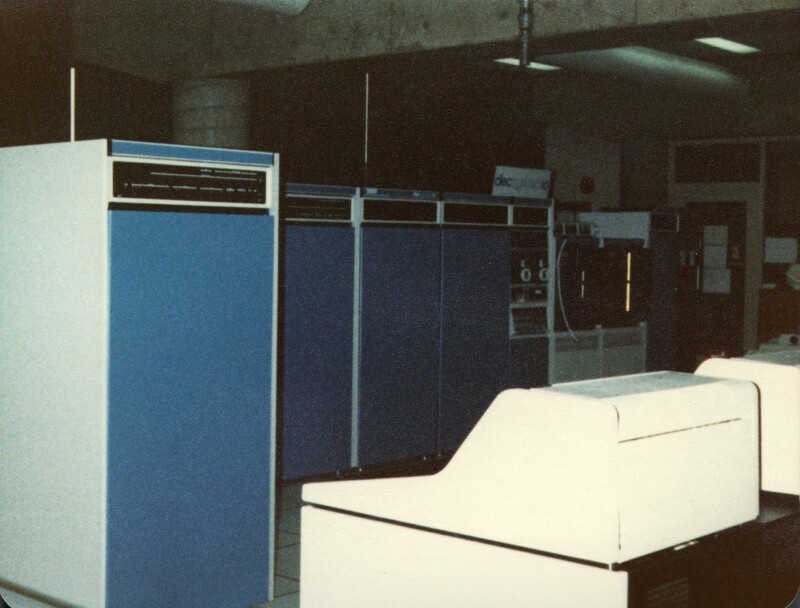 ESPECIALLY "Part V" (Chapter 21) which discusses "The PDP-10 Family". There is a LOT of good information in that chapter. That chapter really resonated with me, and brought back fond memories of programming literally for months and years, in the Macro-10 Assembler language, to learn how computers really worked, and concepts like orthogonality (page 496) was a topic I thought about deeply back when I was learning. The book also mentions (on page 510) ARPAnet connectivy (as described above): "The use of DECsytesm-10 in the Advanced Research Projects Agency (ARPA) funded projects formed another key base for our DECnet protocols and functions [Roberts, 1970]."